Ariana II offers catering for up to 100 guests for your special occasions. We don't serve wine at Ariana II, but you are welcome to bring your own. Ariana Afghan restaurant offers a full array of succulent Afghan dishes to dine out at our restaurant in Kilburn, London and to take away. Enjoy the mysteries of Afghanistan's delicately delicious Dumplings topped with yoghurt and mild ground meat sauce. Savour our Afghan-spiced kebabs, marinated with herbs and spices and lightly seasoned, broiled with onions and peppers, and served with brown rice and salad. Choose from a large selection of Vegetarian dishes, all cooked with fresh sauces and herbs, served with brown Basmati Rice, salad. 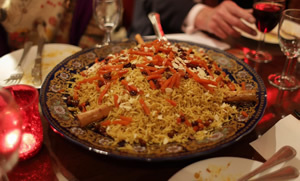 Ariana II Afghan Restaurant offers a full array of titillating Afghan dishes for your dining pleasure at our restaurant in Kilburn, London. Ariana II offers dining space for up to 100 guests over two floors for your special occasions and private or corporate parties. For reservations, please call 0203 490 6709. Includes 2 starters in the form of Homous and Baudinjan buranee. The mains are Kabuli palow with Chicken kebab. Drinks and one dessert are also included. Includes starters in the form of Homous, Baudinjan buranee, a portion of Samosas, and Aushak. 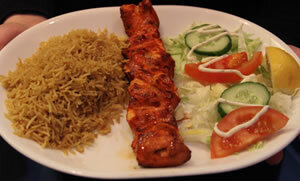 The main course features Kabuli palow, Chicken kebab, Mantu and Lamb kofta kebab. Drinks and two desserts are also included. 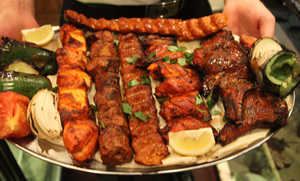 Includes 1 skewer of chicken kebab, 1 skewer of lamb tikka kebab, 2 skewers of lamb kofta kebab, 1 skewer of joojeh kebab, 1 skewer of lamb chops and Kabuli rice (white or brown rice, served with green salad, naan bread and a jug of dough). (Waiting time 20-25 minutes).